Sam’s second complex red plaid shirt is red, white, and black. 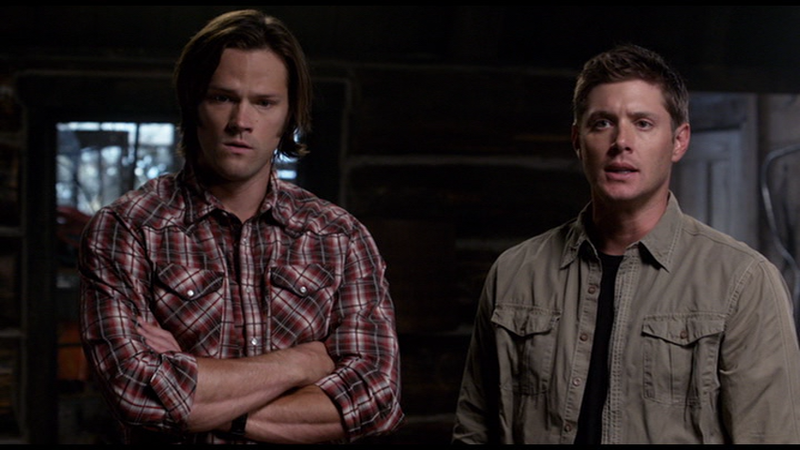 It does up with snaps and is cut in a western style, as is normal for Sam’s shirts. I’m calling it “Hunting Plaid” just to give it a short name, and because I think it’d be easy to see in the woods. In Slash Fiction (7x06), this shirt debuts at Rufus’ cabin, where Sam wears it until they go to Frank’s house. He wears it during the trip to Frank’s house, but by the time they arrive, Sam has changed into a different shirt. In We Need to Talk about Kevin (8x01), Sam wears this shirt when they leave Rufus’ cabin to travel to Wisconsin in an attempt to track down Kevin. He is still wearing it that evening when they get a hotel room, but wears a suit the next day to talk to Channing. In LARP and the Real Girl (8x11), this might be the shirt that Sam is wearing at the beginning of the episode, when he and Dean are in the car. In Everybody Hates Hitler (8x13), Sam wears this shirt at the beginning of the episode when he and Dean first enter the Men of Letters Bunker. In There’s No Place Like Home (10x11), Sam wears this shirt at the very end of the episode when Charlie leaves for Italy. In The Vessel (11x14), Sam wears this shirt in the final scene, when he and Dean are on the pier trying to come to terms with what has happened.